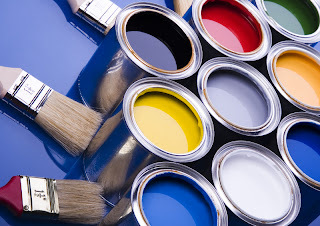 *When selecting paint chips, gather variations of every color you like—pale, saturated, plus cooler and warmer tones. Using these paint chips narrow down your favorites. They are just too small to really see what the color will do in your space so once you’ve chosen your favorites, see if small pots are available in that color. If not, it is a good idea to have a small can mixed for you to try at home. It is SO important to see how the color reacts in your space and light. *Keep in mind that dark, highly saturated shades tend to draw the walls inward, while neutrals make a room seem bigger. *A lot of light washes out colors, so you may decide to try a more saturated shade for a room with a lot of natural light. *Use painter’s tape to hang painted foam core on the wall of the room you plan to paint, then make a point of looking at your samples at different times of day. The light changes during the day and while you may love the color in the morning it may make you feel SICK at night!! !